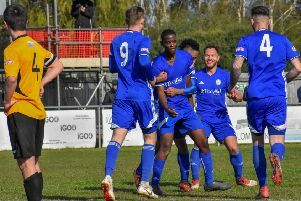 There was a welcome win for struggling Peterborough Northern Star in the United Counties League Premier Division (yesterday). They were at home to Kirby Muxloe and won 3-1 to collect the three points. Two of the Star goals arrived in the last five minutes - from Zak Munton on 87 minutes and James Hill-Seekings on 91 minutes. Hill-Seekings also struck Star’s first goal in the 20th minute, rifling the ball into the net after latching onto a Matthew Barber cross. Yaxley were also impressive winners taking the honours 4-2 at home to Wellingborough Whitworth with goals by Scott Waumsley, Matt Sparrow, Dan Cotton and Jack Saunders. Cotton has now scored 19 goals for the Cuckoos this season. Elsewhere in the Premier Division it was draws all round for the local teams. Wisbech shared the spoils at home to Eynesbury Rovers 3-3, Holbeach drew 1-1 at home to Rothwell Corinthians and Deeping drew 2-2 at league leaders Newport Pagnell. Goals by Dan Bendon (30), Michael Frew (45) and a late Danny Setchell penalty (87) earned the Fenmen their point. Rothwell equalised in the 91st minute against Holbeach, who had Charley Sanders sent off in the second half. William Bird fired the Tigers in front in the 11th minute scoring from a Mitch Griffiths cross. Scott Mooney and Henry Dunn were the Deeping duo on target. Pagnell stay top, eight points ahead of Holbeach with Deeping fourth, Wisbech fifth, Yaxley 10th and Star 14th. In Division One the new managerial team at Blackstones - Lee Clarke and Daniel French - made it seven points out of nine with a 5-2 win against Burton Park Wanderers. Ben Porter led the way on the scoresheet with a hat-trick. Table-topping Pinchbeck were held to a 1-1 draw by visiting Huntingdon while the Bourne v Irchester game was postponed. Stamford were 2-0 winners away to Chasetown in Division One South of the Evo-Stik League thanks to goals by Ben George and Liam Adams but Spalding lost 2-0 at Loughborough Dynamo. The Peterborough Sports v Frickley Athletic match was postponed. In the Thurlow Nunn Eastern League March Town were beaten 3-2 at Needham Market Reserves.